This recipe is my go to recipe when I want some yummy Indian Food, and want the option to do it quickly. This recipe uses authentic ingredients, but it really varies how I prepare it based on what is in the cupboard. SO, here is my basic “go to” recipe from things I typically have in the cabinet to use. …and OF COARSE it’s free of the 10 common food allergens. If you are doing the chic peas from scratch, then start at least 6-8 hours ahead by soaking the chic peas in enough water to cover for 6-8 hours. Drain the soaking water off the chic-peas and place into a dutch oven with enough filtered water to cover by one inch, 2 teaspoons of salt, and 1/4 teaspoon of baking soda. Place on medium high heat until the peas come to a boil, then reduce to medium to medium low (a steady simmer). Cook for 30-45 minutes, until cooked through. You will simply test by eating one after 30 minutes of cooking time. If you have never cooked from scratch before, the baking soda will cause a foam to appear on top. Just skim off with a large spoon and continue cooking. This helps prevent gasiness. While the chic peas are cooking, dice your onion and grate your ginger. When the chic peas are cooked, drain and place in a metal or glass bowl to the side. In a dutch oven, bring your oil to heat. Add the diced onion and saute until the onions begin to caramelize (turn golden and transparent). Add the garam masala and stir for 30 seconds. Add the canned tomatoes, the bouillon, ginger, sugar, and tumeric. Allow to simmer until the bouillon dissolves. 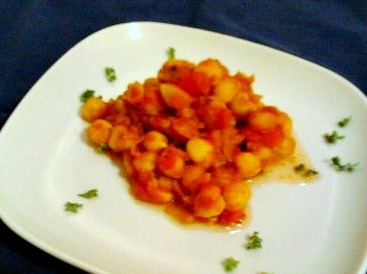 Add the 5 cans of chic peas (drained), or 10 cups cooked and allow to simmer on low for 10-15 minutes, stirring often. Turn off and allow to rest for 10 minutes. Serve over a bed of Basmati Rice with curry veggies or Sag-a-loo. This entry was posted in Recipes and tagged allergy friendly indian food, allergy friendly vegan food, allergy friendly vegan recipes, allergy friendly vegetarian food, allergy friendly vegetarian recipes, channa masala, cookbook, cooking, corn free, dairy free, egg free, food, food allergies, gluten free, hypoallergenic, modified, no fish, no sesame, no shellfish, nut free, onion, rapunzel vegetable bouillon, recipe, soy free, The Allergy Friendly Vegetarian, vegan, vegan indian food, vegetarian, vegetarian dishes, Whole Foods by The Allergy Friendly Vegetarian. Bookmark the permalink.